Of course there were rumblings of discontent. Rumblings of discontent have been a natural consequence of the human order ever since Adam and Eve bit the forbidden fruit. We are self-centered creatures and when things don’t go our way we rumble with discontent. Children rumble against parents when they don’t get their way. Parents grumble about rebellious, self-willed children. Students rumble at their teachers and teachers gripe about their students. Employees rumble with discontent towards their employers. Employers rumble with discontent at their employees. As a leader in our community theatre I get to deal with rumblings of discontent from audience members, actors, directors, members and city officials. Having been a member of many different churches over the years I’ve experienced rumblings of seismic proportions on many occasions and feel tremors of discontent every time I walk through the lobby on a Sunday morning. So, why does it surprise us when it happens? Why do we have this notion that peace and tranquility are somehow the natural order in a fallen world, and why do we act so shocked and amazed when time and again we find ourselves rumbling in conflict? On this chapter-a-day journey through God’s Message we’ve encountered stories of people rumbling with discontent over and over and over and over since the beginning of recorded history. Time and circumstances change, but the discontented rumbling goes on through the eons. Which is why, I believe, Jesus called us to the rather difficult, unnatural task of loving others more than we love ourselves. That’s the calling card. It’s what makes us stand out from others. Everyone loves themselves more than others, but who regularly puts others’ needs ahead of their own? Today is my 46th birthday. It is the 16,803rd day of my Earthly existence. Over the past few weeks I’ve been spending a lot of time in quiet introspection. If I consider the averages I’m well on the downhill side of this journey, but I’m no where near where I want to be. I look in my own heart, examine my own thoughts, and inspect my words and actions. I find far more discontented rumbler than selfless lover. Lord, have mercy on me, a sinner. I want the second half of my journey to count more for God’s Kingdom than the first. I know I haven’t been posting much lately other than my chapter a day. I’ve kind of dropped off Facebook and Twitter as well. It’s not necessarily intentional. It’s been a busy spring. Wendy and I were busy with USP’s spring production. I’m in a busy season of work, the busiest I’ve experienced in many years which has included a hectic business travel schedule. At the same time, we’ve been through a large home project in which the foundation of our house was shored up and the basement completely waterproofed. Now we have a basement piled with all our “stuff” covered in a thick layer of fine cement dust which has to be sorted, cleaned, organized and put away. It all feels pretty mundane and overwhelming at the same time. In addition, my tinnitus has had periods of being markedly worse this spring. 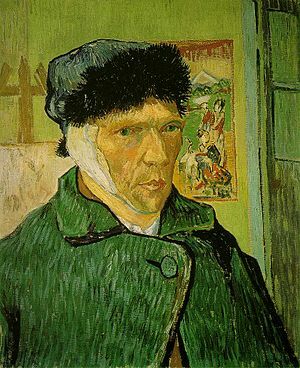 (Side note: There is one school of thought that Vincent Van Gogh went crazy, in part, because of tinnitus and he cut off his ear to rid himself of the incessant ringing. If so, I sympathize with him.) Because of the difficulty I have hearing in places with a lot of ambient noise, I’ve found myself struggling with large social situations and public places. I hate having to ask people to repeat themselves two or three times, or just sitting there hearing the din of conversation but not being able to make out what people are saying. I finally went to the ENT doc to get things checked out only to find that the hearing in my “good” ear has declined rapidly in the past year. The doc suggested I give up caffeine and get fitted for a hearing aid in that ear as well. [sigh] Going through caffeine withdrawal on top of everything else was a barrel of fun. I’m whining. I know, and I beg your forgiveness. I’m blessed that technology and available resources mean I can get what I need to help me hear. Nevertheless, I admit that the reality of my auditory decline has left me feeling a little sad even as I prepare to celebrate my 46th birthday on Monday. Wendy and I will, however, be at the (blessedly quiet) lake with my folks, Taylor, and Clayton. I’m really looking forward to being there, even if it is only for a day or two. The premise of this thinking, is that our salvation is ultimately determined by what we do and that God will ultimately judge us based on how the scale reads at the end of our life. God’s Message, however, reveals a completely different picture. Jesus said that the little bit of bad we do is like yeast in bread dough. It’s the smallest of ingredients, yet it taints the entire loaf. Once the yeast is in the dough you can’t reverse its effect. In the same way, even the “little white lies” that we tell, like Ananias and Sapphira in today’s chapter, taint our entire soul. There is no amount of good that we can do to negate and purify us from the effects of the bad that we have done. Salvation is not determined by what we do because no amount of effort can eradicate it from our hearts and lives. Sin is a lethal, spiritual super virus. Once it’s in our system (and it’s in all of us) there is no regimen, no matter how rigorous, that can flush it out. Our culture is blessed by ancestors who believed in the need for education. Before public education was available, virtually all of America’s private educational institutions were founded by followers of Jesus who felt that education was a crucial need for their children and for the successful future of generations who would come after. Today, between private colleges, community colleges, public universities, education for working adults, and on-line coursework, a higher education is more readily available than any time in history. I have, however, come to realize that our belief in higher education can easily and subtly deceive us. Education is not spiritual knowledge. A diploma does not give you wisdom. A higher education is not equal to, nor superior to spiritual giftedness. I have witnessed many men and women who were placed in positions as teachers and pastors because they had the right educational credentials, but those individuals failed and their churches suffered because they were not spiritually gifted for the task. I have likewise known successful pastors and teachers who never darkened the door of a college or seminary, but who were blessed with spiritual gifts that more than enabled them for the task. Education is important, but a institution of higher learning is not Holy Spirit. Having a string of letters behind your name should never be confused with spiritual knowledge, wisdom or giftedness. I find today’s chapter fascinating and heartening. Peter and John, these uneducated, blue-collar fishermen from the sticks, had been transformed in a matter of weeks from fearful, skulking followers into bold and capable leaders who would change the course of human history. We can all be encouraged by that. What any of us may lack in education and abilities is nothing compared to what the fullness of God’s Spirit in us makes possible. Grandma Jeanne got a 3D picture for a Christmas white elephant gift. 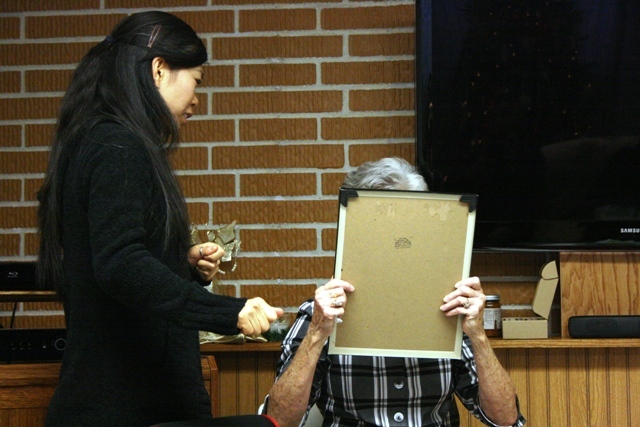 Kumi tried to help her see the embedded hidden image. When I was in high school and college a fad developed around strange looking three dimensional “artwork.” A seemingly abstract, meaningless picture of colors and lines would suddenly reveal a three dimensional picture if you looked at it just right. Suddenly there were entire stores at the mall dedicated to selling these crazy pictures. Walk by the store or kiosk and you’d find people standing and trying to help their friends see the embedded 3D image. I find a certain parallel to God’s Message in that experience. Some people have spiritual eyes that are open to see the Truth of it and are, at some point, moved to respond to what they see. Others can look and hear the same Message and see nothing at all. Like the crowds in today’s chapter, some were immediately amazed and drawn to what Peter said. Three thousand of them chose to start their own faith journey following Jesus that day. As many, if not more, simply dismissed what they saw and heard as crazy talk from a bunch of drunk fishermen from out-of-town. I often remind myself that Jesus said He not only came to open the eyes of those who cannot see, but also to reveal that those who think they can see are actually blind.